Last Friday I posted a recipe for a Gin Fizz, a classic cocktail favored in the days of flappers and bathtub gin. 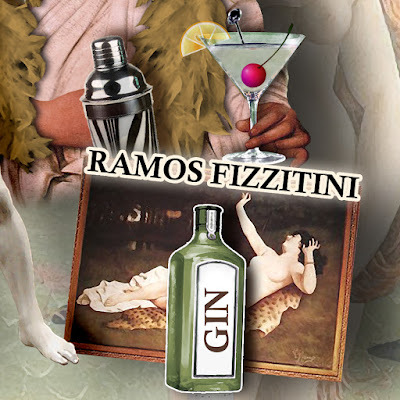 Today I'm posting the recipe for The Ramos Fizz-itini - the Big Fat Brother of the Gin Fizz! Why do I call it the Big Fat brother? Because it's basically a Gin Fizz with cream and egg whites in place of the club soda! There's also a little lime and an orange flavor added with a few drops of orange flower water. I have seen recipes that use Cointreau in place of the orange flower water (which can be difficult to find), you can also substitute a few drops of Grand Marnier. Egg whites were often used to give drinks a fluffy, frothy quality. In these days of worry over salmonella poisoning you can use pasteurized egg whites which can be found in the dairy compartment at your grocers and I'm told there are powdered versions available online too, though I have not tried using those, however, food experts now agree that as long as your egg is fresh there is very little likelihood of contamination!